Instructional Design (ID) is the methodical process of determining, creating, delivering, and evaluating learning and training solutions. It is a foundational component of successful learning. Think of Instructional Design as the fundamental architecture, the blueprint, of the learning territory. The components, considerations, planning, and elements of Instructional Design work together as a compass, revealing the direction an instructional approach should take. An Instructional Design Model is used to guide this process. An ID model may follow a sequential, linear format. Other models are more flexible in their structure, allowing the instructional designer to follow an order or process that is the most logical or practical for the instructional project at hand. Instructional Design may also be referenced as Instructional Systems, Instructional Systems Design, Instructional Systems Development, or Learning Systems Design. Throughout this website, we reference the more common Instructional Design nomenclature. 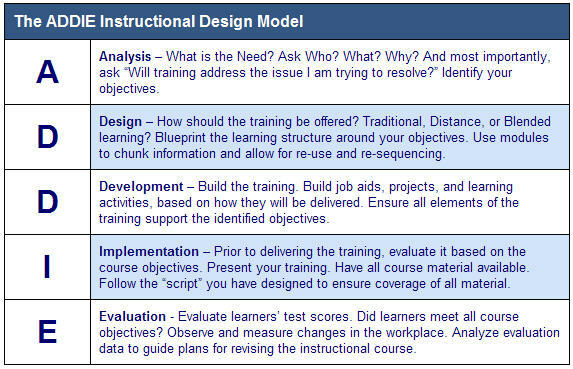 In general terms, this Instructional Design Model is known as ADDIE (Analysis, Design, Development, Implementation, and Evaluation). Most ID models are based on this common model.